Ajax Amsterdam came back from a goal down to earn a 1-1 draw with Juventus in the quarterfinal of the Champions League on Wednesday night. A Cristiano Ronaldo header in the 45th minute gave the Italians the lead, only for the goal to be cancelled out by David Neres 30 seconds after the restart. Speaking as a pundit on SuperSport, former Everton defender Joseph Yobo lavished praise on the two goalscorers, admitting that Ronaldo is getting fitter despite his age and Neres is enjoying a good run of goalscoring form. ''I played against him when I was in the Premier League and he's got a very good leap, his timing is unbelievable,'' Yobo said. On Neres, Yobo said : ''You can see a long ball from the left back. The Juventus defender could have sent it back, safety first, but he tried to control the ball. 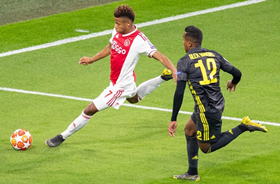 ''Credit to this young lad David Neres, individual play, that's a brilliant goal. He is one to look out for, he has scored 6 in his last seven appearances. While Juventus have been crowned champions of Europe on two occasions, Ajax have won the Champions League four times, with their last triumph coming in 1995.